Surely in this thread he will be sacked. It's made on Christmas eve. The day before the greatest comeback king was born. I speak for the peoples. The peoples had no good feel with your thread. This thread won't be worthwhile until the first manifesto is presented. Is this a question, or you just got stuck with your finger? Serie A: 37 matches, 64 points, 17 victories, 13 draws and 7 defeats. 58 goals scored and 40 goals conceded. Champions League: 8 matches, 3 victories, 3 draws and 2 defeats. 10 goals scored and 9 goals conceded. Coppa Italia: 1 match, 1 defeat. 1 goal scored and 2 goals conceded. In total: 46 matches, 20 victories, 16 draws and 10 defeats. 69 goals scored and 51 goals conceded. January: Milan-Siena 2-1, Juventus-Milan 2-1, Sampdoria-Milan 0-0, Milan-Bologna 2-1, Atalanta-Milan 0-1. February: Milan-Udinese 2-1, Cagliari-Milan 1-1, Milan-Parma 2-1, Milan-Barcelona 2-0, Inter-Milan 1-1. March: Milan-Lazio 3-0, Genoa-Milan 0-2, Barcelona-Milan 4-0, Milan-Palermo 2-0, Chievo-Milan 0-1. 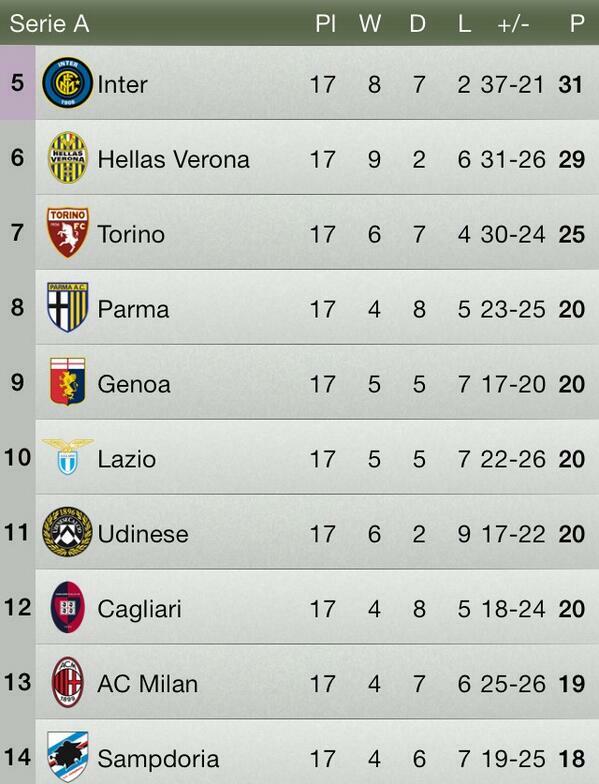 April: Fiorentina-Milan 2-2, Milan-Napoli 1-1, Juventus-Milan 1-0, Milan-Catania 4-2. May: Milan-Torino 1-0, Pescara-Milan 0-4, Milan-Roma 0-0, Siena-Milan 1-2. September: Milan-Cagliari 3-1, Torino-Milan 2-2, Milan-Celtic 2-0, Milan-Napoli 1-2, Bologna-Milan 3-3, Milan-Sampdoria 1-0. October: Ajax-Milan 1-1, Juventus-Milan 3-2, Milan-Udinese 1-0, Milan-Barcelona 1-1, Parma-Milan 3-2, Milan-Lazio 1-1. November: Milan-Fiorentina 0-2, Barcelona-Milan 3-1, Chievo-Milan 0-0, Milan-Genoa 1-1, Celtic-Milan 0-3. December: Catania-Milan 1-3, Livorno-Milan 2-2, Milan-Ajax 0-0, Milan-Roma 2-2, Inter-Milan 1-0. What's with your attitude? I just can't decipher your cryptic message.